The promise of greater efficiency and reliability over a long lifetime has enabled LEDs to penetrate almost all lighting markets. They’re being installed in residential, industrial, healthcare, and office applications. Almost everywhere we go, LEDs are illuminating the environment. While visible LEDs are rapidly being adopted, manufacturers have been slow to embrace LEDs that operate outside of the visible spectrum such as UV LEDs. Several challenges impede mass adoption of UV LEDs, specifically for those in the UVB (280nm – 315nm) and UVC (100nm-280nm) spectral regions. LED manufacturers are struggling to improve light output and efficiency while at the same time increase the reliability and useable life of the LED. Improvements are being made, but they often come with a high price tag. Lighting manufacturers cite the initial and total cost of ownership as one of the primary obstacles preventing them from making the switch. In this article, I’ll review recent research that aims to improve near UV LED (NUV-LED), and deep UV LED (DUV-LED) technology. NUV-LEDs encompass the UVA spectral range (315nm – 400nm) and parts of the UVB spectral range. Closest to the visible spectrum, their long wavelengths are often used in applications that require fluorescing, like counterfeit currency detection and nondestructive testing. They’re also used for lithography and for curing industrial coatings, adhesives, inks, and paints. UV LEDs on the tail end of the blue spectrum, specifically those at 365nm and 385nm, are easier to manufacture and are currently the most efficient of the UV LEDs. Research and technology developed for visible LEDs provided an existing infrastructure that NUV-LEDs manufacturers could work from. NUV-LEDs based on a GaN substrate have demonstrated external quantum efficiencies (EQE) of ~40% at 645nm and EQE of ~60% at 400nm. Applications that use NUV-LEDs currently represent the largest segment of the UV LED market, with UV curing driving the bulk of that growth. UV-LEDs offer numerous benefits for UV curing. System miniaturization and faster line speeds have improved productivity, and LED efficiency has lowered energy costs. While NUV-LEDs are currently more efficient and affordable than deep UV LEDs (DUV LEDS), researchers still seek to improve performance and reduce manufacturing costs. I recently attended Photonics West 2015; during the presentation “Improved UV LED Performance Using Transparent Conductive Films Embedded Plasmonic Structures” researchers shared a novel fabrication process that improved the light extraction efficiency of the LED. Researchers spin-coated silver nanoparticles onto the LED substrate before depositing the indium tin oxide layer. This created a suspended nanoparticle layer that increased light output by 1.4 times the magnitude of conventional NUV-LEDs. At this time, the process is only feasible at the upper end of the UV spectrum. UV LED applications and their required wavelength range. Kneissl, M. (2010), Development of UV-LED Disinfection, Techneau. 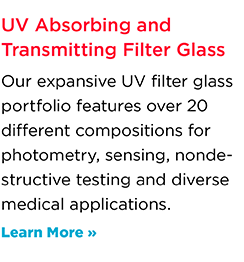 At the deep end of the UV spectrum, applications include germicidal sterilization equipment, rapid surface curing systems for inks and lacquers, and spectroscopy and fluorescence instrumentation. DUV-LEDs in the 250 nm to 280 nm spectral range are used for water purification, food, and medical sterilization, and for air purification within HVAC systems. As we move deeper in the UVC region, DUV-LED performance suffers. Typical EQE is between 3% – 8% and their lifetime is shorter compared to NUV-LEDs. Most performance issues stem from minor impurities and crystalline structure defects in the substrate. Other challenges include reducing resistance in the current spreading layer and enhancing light extraction from the chip. The potential applications and market size are spurring researchers to overcome these challenges by exploring different semiconductor and substrate materials and refining the manufacturing process. Crystal IS first pioneered native bulk aluminum nitride (AlN) substrates, with them they were able to achieve higher light outputs and extend the projected lifetime of the LED. Other manufacturers are looking to harness the AlN on AlN substrate approach. Earlier this month, Japan’s National Institute of Information and Communications Technology (NICT) announced a new AlN on AlN DUV-LED that has a continuous light emission with an output of 90 mW/cm2 at 265 nm. They expect the LED to be used in portable sterilizers and virucidal systems. NICT claims that their new LED has the world’s highest EQE at 6.3% at a current of 200 mA. While native AlN substrates promise better performance, they are estimated to be between 2.5x to 4x more expensive than sapphire substrates. Researchers continue to explore other substrates and improve manufacturing processes to reduce costs. Sensor Electronic Technology, Inc. (SETi) launched a new DUV-LED at Photonics West 2015 with 2.5mW of optical power at 265nm – 280nm. This increased performance doubles existing wall-plug efficiency. During their presentation “High-efficiency UV LEDs on sapphire,” they explained how they were able to reduce defects and improve performance by controlling the interface between the LED and the substrate crystalline structures. These DUV-LEDs became available to a broader market in April 2015. Also at Photonics West 2015, research from the Ferdinand-Braun Institute and Technische University explored advances in the development of AlGaN-based LEDs that emit in the UVC spectral region. They identified success in reducing defects in the semiconductor layers by applying the epitaxial lateral overgrowth (ELO) technique on micro-structured AlN layers. Earlier this week, the European Union’s Restriction of Hazardous Substances (RoHS) directive that permitted the use of mercury in high-pressure mercury vapor lamps expired. Mercury is no longer allowed to be used for “general purpose” lighting as of April 13, 2015. While this doesn’t impact “special purpose” lamps that are used for industrial applications, it is a reminder that organizations worldwide want to shift to more environmentally friendly solutions. UV LEDs comply with the US Energy Policy Act and European Union’s RoHS directive and do not contain mercury, which is often found in CFL light sources. Their adoption will accelerate as manufacturers improve efficiency and can offer them at a more affordable price. According to the Yole Développement report “UV -LED – Technology, Manufacturing and Application Trends 2015,” the UV LED market is expected to grow from $90m in 2014 to ~$520m in 2019. The research and technology advances shared at Photonics West 2015 were exciting and promise that UV LEDs will soon complete the LED revolution. This is a great article from UV+EB Technology on the technological advances that have accelerated UV LED adoption for ink curing. Lower costs, better thermal management, and secondary optics that improve irradiance make UV LED systems a viable option for UV curing. New UV LEDs are being developed and released frequently. It can be difficult to understand the differences between models and how they work in real operating conditions. In this white paper, Lumileds explains how to make an accurate performance assessment from an LED datasheet. The compact size and efficiency of LEDs make them perfect candidates for spectroscopic instruments. In this Laser Focus World article, they review several applications and the benefits LEDs provide, which in some cases can reduce instrument costs by 40% to 80%. UV LEDs can often exceed the performance of lamp-based systems. In this article, the authors compare UV LEDs to xenon flash lamps for DNA purity and concentration measurements.